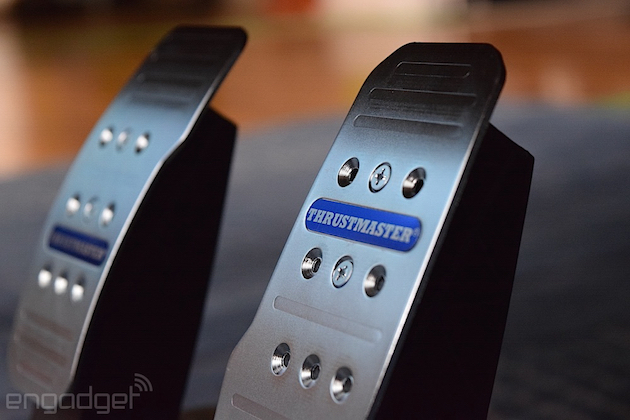 Let's get this out of the way up front: The market for the Thrustmaster T300RS is incredibly narrow. At $400 (the price of a PlayStation 4!) it's far beyond an impulse buy and demands you're taking every aspect of your living room racing experience Very Seriously. That's something I discovered when the company sent me a demo unit to try. To Thrustmaster's credit, the initial setup was incredibly easy and took about 10 minutes total. The T300RS comes in three pieces -- wheel, motor base and foot-pedal board -- and the necessary cables and power cord were long enough to reach everything without the need for extensions. Compared to other racing wheels, though, the T300RS' mounting options are a tad limited when it comes to casual use. The wheel module needs a surface that's at least 6 inches deep for it to clamp onto for a stable experience. The lip on my coffee table only extends about 2 inches, providing anything but. After a few hours of frustration and worrying I was going to break something by tightening the clamp as much as I did, I detached the unit from my coffee table and put it in my lap. Unlike the Mad Catz' Force Feedback Xbox One wheel's lap rest, however, there isn't a way to keep the T300RS there securely. I awkwardly gripped the wheel between my thighs, which sort of okay worked while I tooled around Canada and Scotland in DriveClub, but this made operating the gas and brake pedals more difficult than it already was. Why's that? Well, because as far as I can tell, the pedal-base isn't meant to be used anywhere outside of being a hard-mounted racing seat setup. The nine small rubber squares on the bottom didn't do anything to keep the board in place on hardwood, and were even less effective with carpet. The brief moments where everything was working in concert and I wasn't fighting my living room to keep the illusion of being behind the wheel of an Aston Martin Vanquish were killer, though. There's an inherent thrill to gripping an actual wheel, pulling on an aluminum paddle shifter to drop a gear and easing your foot onto a brake pedal coming into a turn. Same goes for hitting the apex, flooring the accelerator and slapping the other paddle to upshift, but realizing you were too aggressive with the gas (through the steering wheel thanks to force feedback motors tucked inside the unit's base) and feeling the rear-end break away. It's something that feathering the DualShock 4's lower triggers, jabbing the left control stick and alternating between the circle and triangle buttons to shift down and up, respectively, just can't match. The T300RS is ahead of its time, though; the type of game that demands the precision it affords doesn't exist yet. Well, at least not on the PlayStation 4. Project Cars still isn't out, and DriveClub only offers a bare-minimum level of support for racing wheels. I could assign custom bindings to face buttons and adjust levels of steering assist, force feedback strength and vibration, but that's it, really. That might sound generous on paper, but the unit is cross-compatible with PlayStation 3 games as well, and compared to a sim like F1 2014 (I don't own Gran Turismo 6) that offers adjustments for both steering-and-throttle deadzones and saturation among others, it's pretty paltry. The coarse tuning options meant I couldn't be sure if the game's physics and handling were too imprecise or if I was simply over-correcting due to loose, arcade-style controls. The T300RS is ahead of its time, though; the type of game that demands the precision it affords doesn't exist yet. What the T300RS does manage, surprisingly, is making the otherwise dull DriveClub actually enjoyable to play. Except, rather than competing with the AI opponents on the track, I was racing against myself and seeing how much better I could get at using the wheel -- a meta-challenge of sorts -- and not worrying about the game's archaic career mode. Is it worth dropping $400 to make one of last fall's most underwhelming games relatively fresh and exciting? No -- not even if you have the cash and room to spare. It's a shame, really, because you're definitely getting what you pay for here. But when you'll actually see its full potential is anyone's guess.